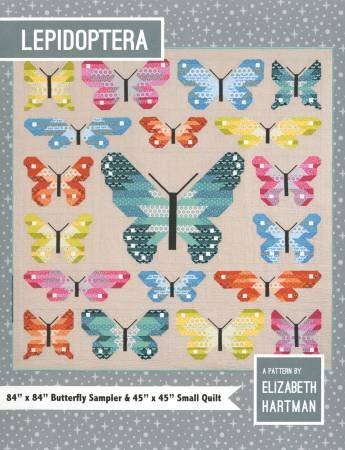 Like the biological order for which it’s named, Elizabeth Hartman's Lepidoptera sampler quilt includes a variety of beautiful butterflies and moths. Cheerful butterflies named Alice, Beatrix, Carmen, Della, Eugenia, and Fern combine to make an 84” x 84” sampler quilt perfect for using your favorite colorful fat quarters! The 45” x 45” Small Quilt includes a single large-scale Alice block and makes a perfect baby quilt or wall hanging. All blocks are sewn with simple straight and diagonal seams. No templates or paper piecing! Printed in booklet form and perfect for fat quarter collections!